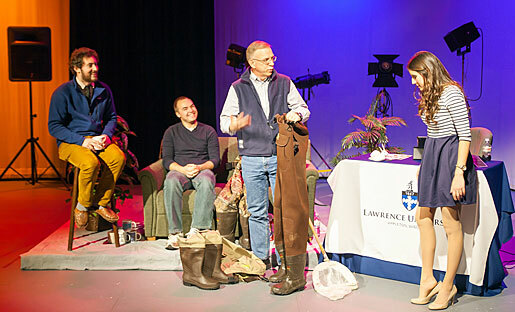 It’s the Little Apple(ton), not the Big Apple, but starting at 9 a.m. Tuesday, Nov. 10, Lawrence University will stage its second annual “Giving Day,” a 12-hour live extravaganza webcast worldwide, featuring a cast of thousands, or at least dozens, ranging from President Mark Burstein and Mile of Music co-founder Cory Chisel to head football coach Rob McCarthy and the Lawrence Faculty Jazz Quartet. 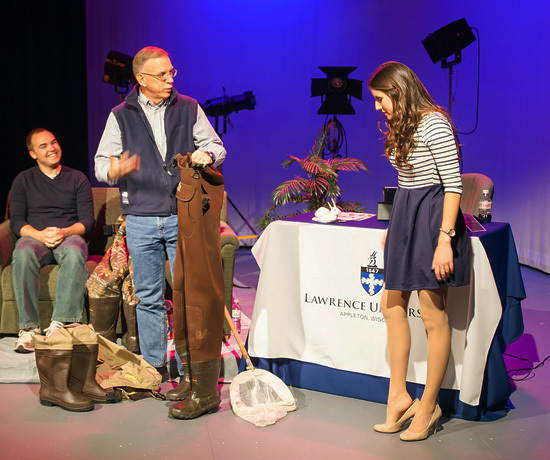 Giving Day co-host Kasey Corrado (right) gets ready to try out a pair of hip waders courtesy of biologist Bart De Stasio (center) as he gives her a primer on doing research out in the field during 2014’s Giving Day live show.. 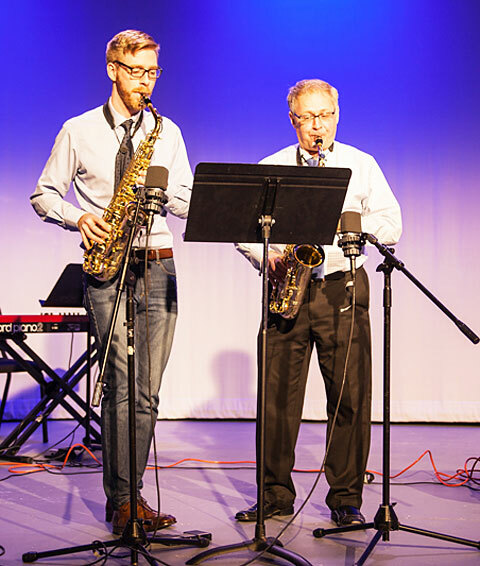 The show will include interesting interviews and eclectic performances celebrating things happening at the college and showcasing the people and programs that make Lawrence distinctive. 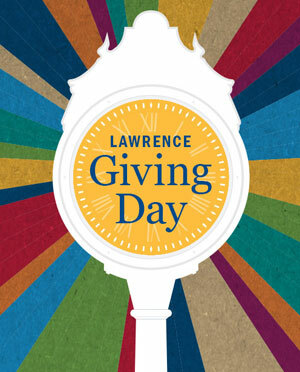 Held for the first time in November, 2014, Giving Day is a special one-day opportunity for alumni and friends to show their support for Lawrence and its programs. Last year’s Giving Day, with the help of “game changers” who matched donations, raised $1.1 million for the college. Kasey Corrado, Lawrence’s social media specialist, returns for her second stint as co-host of the 12-hour live show. She will be joined by senior Jon Hanrahan, a piano performance major from Johnsburg, Ill. The webcast, available at go.lawrence.edu/givingday, will feature hourly “themes” on such topics as diversity, the arts, community service and of course, academics. From 7-8 p.m., everyone will be asked to don their thinking caps for a 60-minute trivia warm-up for Lawrence’s real deal 50-hour contest coming in late January. During the course of the show, Corrado will be more than just a passive host. She’s planning on learning a little Mandarin, creating a work of art with the help of sculptor Rob Neilson and boning up on her chemistry knowledge with chemist Stefan Debbert. Hanrahan, whose qualifications for his co-host role include four year’s performing with Lawrence’s improvisational troupe Optimistic Feral Children and three years as a trivia master, says his game plan is simple: Just dive in. “I’m going to keep a curious mind turned on and gently nudge guests to the point where they have no choice but to share what they think, deep down, makes Lawrence such a weird, wonderful, impactful place,” said Hanrahan, who claims he’s made it through an entire trivia contest weekend without the aid of caffeine. Amid all the fun and games, Hanrahan wants the viewers to also appreciate the purpose of Giving Day. 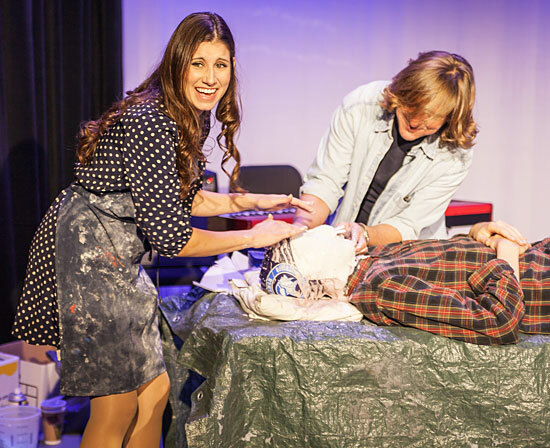 Rachel Crowl, one of the masterminds behind this year’s Giving Day live show, will again handle all the off-camera chain saw juggling that goes with staging such a production. “Compared to last year, this is a far more ambitious undertaking, so I fully expect all kinds of interesting things to go wrong. It is 12 straight hours after all,” Crowl said with a laugh. The complete Giving Day webcast schedule can be found here.